On September 26, 2015 the McGlohon Theater in Charlotte will be filled with laughter and having you rolling in the aisles. 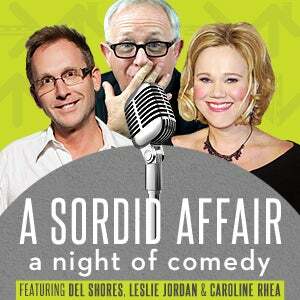 A Sordid Affair, brings together three comedy LEGENDS from the Sordid Lives series; writer and producer Del Shores, TV and movie icons Caroline Rhea and the incomparable Mr. Leslie Jordan all to raise money for Different Roads Home, Inc. in Charlotte. The evening begins at 7 pm and will be nonstop laughter, with a silent celebrity item auction and a private VIP Meet and Greet opportunity with the stars. The show is presented by Different Roads Home, along with its signature sponsor Rosedale Infectious Diseases. A special VIP Package is on sale for only $132.09, while regular Orchestra seating is on sale for $32.09 (an ode to a great memory in the Sordid Lives movie). All balcony seating is $25.00. VIP Package is limited to only 58 seats and includes a seat in the first five rows of the theatre, a Sordid Affair “swag bag” with signed memorabilia from all three artists, and a private meet and greet cocktail reception following the show from 9:30 pm toll 11:00 pm where you can get photos with all the artists and enjoy complimentary appetizers and beverages. DO NOT MISS THIS once in a lifetime opportunity!!! Del Shores has written, directed and produced successfully across studio and independent film, network and cable television as well as theatre. Shores’ career took off with the play Daddy’s Dyin’ (Who’s Got The Will?) in 1987, which ran two years, winning many Los Angeles theatre awards, including LA Weekly’s Best Production and Best Writing. The play has subsequently been produced in over 2,500 theatres worldwide. A movie version of Daddy’s Dyin’ was released in 1990 by MGM starring Beau Bridges, Tess Harper, Judge Reinhold, Keith Carradine and Beverly D’Angelo. Sordid Lives, his fourth play, opened in Los Angeles in 1996 and ran 13 sold-out months. The play went on to win 14 Drama-Logue Theatre Awards, including three for Shores for wring, directing and producing. There have since been over 300 additional stage productions of the play. In 1999, Shores wrote and directed the film version of Sordid Lives starring Beau Bridges, Delta Burke, Olivia Newton-John, Bonnie Bedelia, Leslie Jordan and Beth Grant along with most of the original cast from the play. Opening in only eight theatres across the country, the little film that could took in nearly two million dollars in its limited release. The movie became a cult phenomenon and became the longest running film in the history of Palm Springs with a record ninety-six weeks. Leslie Jordan is the prestigious Emmy Award winner in 2006 for “Will & Grace”. He has enjoyed rapturous reviews for his original stage plays (“My Trip down the Pink Carpet”, “Stories I can’t tell Mama”, “Fruit Fly”), and supporting presence in one of Hollywood’s most prestigious, message-minded films of the last decade (“The Help”, 2012). His defining role as “Brother Boy” in the cult film sensation “Sordid Lives” evolved into a well-received prequel on the Logo Channel. As the celebrated author and star of his own HBO Special (“Pink Carpet”); Leslie Jordan remains consistently sought after as a Guest Star on every imaginable form of episodic, comedic television (TV Land’s “The Ex’es”, Fox’s “Raising Hope”, Disney Channel’s “Shake It Up!”, and ABC’s “The Neighbors”. He enjoyed a star turn in the third season of FX’s instant classic “American Horror Story” opposite Hollywood heavyweights Jessica Lange, Kathy Bates, Angela Bassett, Sarah Paulson and Francis Conroy. Caroline Rhea is a Canadian stand-up comedian, actress and model who was the original host of the reality television show The Biggest Loser on NBC until she was replaced by Alison Sweeney after the end of Season 3. She is also known for her role as Hilda Spellman from Sabrina, the Teenage Witch, and for replacing Rosie O'Donnell as the hostess of her syndicated talk show, renamed The Caroline Rhea Show. She has appeared in Comic Relief 8, as well as the Ms. Foundation's "Women of Comedy from Caroline's Comedy Club" (no relation to Rhea). She appeared as a contestant in 2001 on a special edition of Who Wants to Be a Millionaire, winning $125,000 for charity. She had her own stand-up special as part of Bravo's three-part Funny Ladies series, along with Joan Rivers and Paula Poundstone. Rhea has had a recurring role on the hit Disney Channel Original Series, The Suite Life of Zack & Cody , an inspector turned manager of the rival hotel. In the series, she is well known for a large mole on her cheek. She has appeared on Disney's Mom's Got a Date with a Vampire as the mother and also Christmas with the Kranks in 2004. She has competed on Bravo's Celebrity Poker Showdown and GSN's World Series of Blackjack.